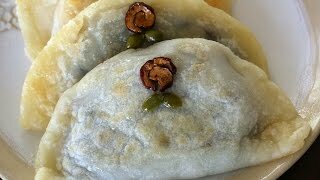 Today I’m going to show you how to make bukkumi, pan fried rice cakes filled with sweet red beans, or with mung bean paste. These rice cakes are gooey, chewy, and sweet on the inside and crispy on the outside. The texture is just wonderful, both soft and crispy at the same time. The best thing about these is that they are very quick to make. With a box of glutinous rice flour and a can of sweet red beans, you can make them in 10 minutes! 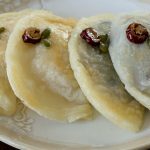 If a Korean grocery store is far away from your home, you can buy these ingredients on Amazon, or you can make your own sweet red bean paste, or use the mung bean paste that I show you in this recipe. When I lived in Korea, these were a lot harder to make because they didn’t sell glutinous rice flour in a box. You had to bring your soaked and strained chapssal (glutinous rice) to the local mill and have them grind it into flour for you. So it’s a real treat for me to be able to make them so easily these days. If you like to make bukkumi and save some for later, you can freeze them up to one month. To serve them, reheat in the microwave or in a pan with a bit of oil. I love the cute name of this dish! Let me know how yours turn out! Strain the beans and put them into a heavy pot. Add ⅓ cup water and a pinch of salt. Cover and cook for 10 minutes over medium heat. Keep an eye on them to see if a lot of bubbles form. If so, open the lid and stir the beans with a wooden spoon. Cover and keep cooking. Turn down the the heat to very low and simmer for another 5 minutes. Remove from the heat and mash the beans with a wooden spoon until they form a smooth, soft, shapeable dough. Add the honey and mix well. You can make 8 to 10 bukkumi with this amount of mung bean paste. Take 2 to 3 tablespoons of the paste and and roll it between the palms of your hands to shape it into a little football. Roll all the paste into footballs and set aside. Combine the rice flour, salt, and hot water in a mixing bowl. Mix with a wooden spoon until it cools down, and knead the dough with your hand for 1 minute until it turns into a lump. Wrap it in plastic wrap and let it sit. 5 to 10 minutes later, knead it again on the cutting board until it turns smooth, for about 2 minutes. Use some extra rice flour to dust the cutting board so the dough doesn’t stick to it. Divide the dough into 4 equal pieces. Roll each piece between your hands, into a ball. Put each ball onto the cutting board one by one and roll them out to about 5½ inch disks. Heat up a non-stick pan over medium heat. 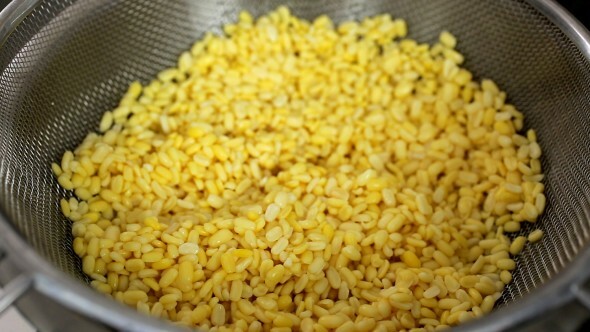 Add about 1 tablespoon cooking oil and 1/2 teaspoon of sesame oil. Swirl the pan to mix the oil evenly. Put one of the dough disks on the pan and cook for 30 to 40 seconds until the edges start cooking and it looks a little translucent. Flip it over and add one of the mung bean paste balls to the center of it. If you’re using canned sweet red bean paste, scoop about 2 to 3 tablespoons worth into the center. Fold the disk over with your spatula to make a half moon. Press the edge slightly and let it cook for 1 minute. Turn it over and cook until both sides are a little crunchy, but not browned. Repeat with the rest of the disks and bean paste. Garnish with jujube and pumpkin seeds, and serve as a dessert or snack with coffee or tea. Posted on Tuesday, July 21st, 2015 at 12:50 pm. Posted August 1st, 2015 at 2:05 am | Log in to reply. Posted August 3rd, 2015 at 4:05 pm | Log in to reply. Thank you for sharing your Malaysian version of fried rice cake. It sounds very delicious! Posted July 24th, 2015 at 11:17 am | Log in to reply. I like them with all kinds of filling. You could try chestnut paste or lotus seed paste too. I was not too thrilled with red bean paste either until i tried one that was made very smooth like the filling of a sesame ball. This is done by straining the bean husks, adding some oil and a little more cooking. Some types of custard might even be tasty. Posted July 21st, 2015 at 6:44 pm | Log in to reply. As a Korean, I’m ashamed to admit I strongly dislike red bean paste and mung bean paste. My grandmother and dad were always so kind to let me eat the dduk while they ate the filling. So if I was to swap the paste for cooked fruit or even jam, do you think it would work? Is there a reason for why you make the half moon after you start cooking these cakes? Wouldn’t it be easier to fold them in half before cooking first? Posted July 24th, 2015 at 4:05 pm | Log in to reply. Yes, you can add anything you want. Why not! : ) I just want to show an authentic recipe. Some people don’t like sweet red bean paste and some people love it. Me? I love it! Posted July 21st, 2015 at 6:33 pm | Log in to reply. thank you for the recipe maangchi! but how about 수수부꾸미? how do i make the dough pinky like that? Posted July 24th, 2015 at 3:48 pm | Log in to reply. Mix glutinous sorghum powder and glutinous rice flour to make one cup and follow the recipe. Posted July 27th, 2015 at 3:34 am | Log in to reply. Posted July 27th, 2015 at 3:41 am | Log in to reply. 그런데 glutinous sorghum powder는 한국말로 어떻게 돼세요? 지금 서울에 살고 있는데…감사합니다! Posted July 27th, 2015 at 3:57 am | Log in to reply. Posted July 28th, 2015 at 9:55 am | Log in to reply. Glutinous sorghum powder is “찰수수가루” in Korean. This recipe was originally posted on July 21, 2015 at 12:50 pm by Maangchi. The video was watched 561,280 times on YouTube & has 9,219 likes!